A choice of 5km, min 35 obstacles and 10km, min 46 obstacles. Off road routes that depending on time of year, as spring routes are different to autumn, include marsh, bog, rivers and woodland, rough hilly ground interspersed with tracks and fields, and if that was not enough, at the end you will encounter 800 metres of deep mud and water between 24 plus obstacles to negotiate en route to the finish. The obstacles are evenly, tightly spread around the course. They are large and over half have more than one component to them, to climb, jump, wade, swing and crawl over and under. It will seem endless and you will need to dig deep and muster every bit of stamina to maintain your pace and position. The harder you push yourself, the more intense it will become and relief will only come when you cross the famous double K's finish line of the Krypton factor. 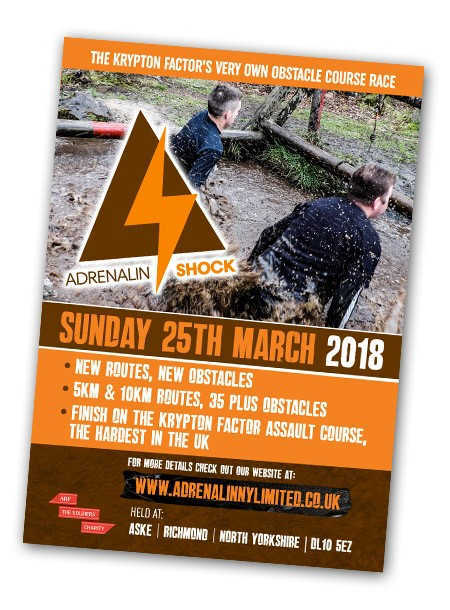 This race is designed to minimise queuing at obstacles and run by ex parachute regiment soldiers, who know tough. Entry fee is £27 per entrant for the 10km course, or £19 per entrant for the 5km course. Teams will be welcome. Be aware that there are a limited number of places for this race.